A few years ago, the ductless mini-split heat pump system came to Seattle and caused a mini-revolution in heating and air conditioning. 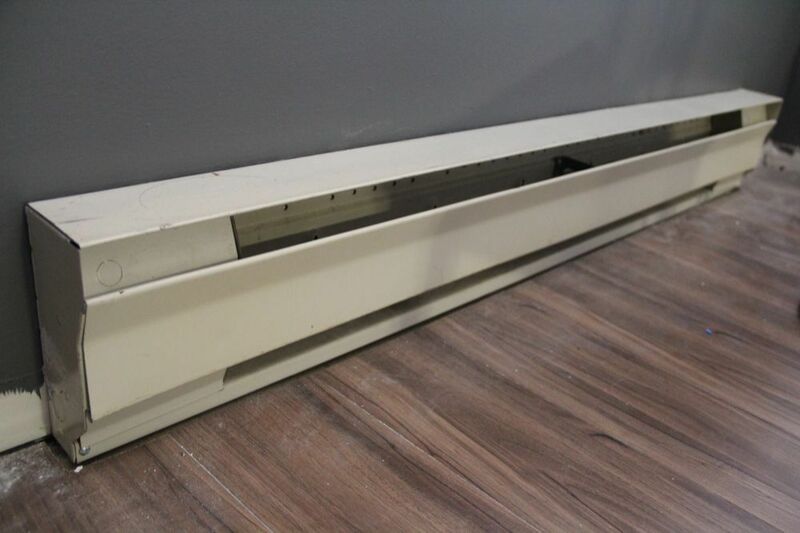 Homes with no ductwork could now have a mini-split installed for a reasonable price and receive high efficiency heating and air conditioning for the first time. As a bonus, these systems usually pay for themselves within a few years. As word of these new options has spread, many homeowners in Seattle have taken advantage and are much more comfortable and efficient in their homes. Utilities, such as Seattle City Light and Puget Sound Energy, have jumped on board with instant rebate offerings to their customers, further helping to spread this new, amazing technology. The ductless system solved many problems, but it didn’t solve all of them. 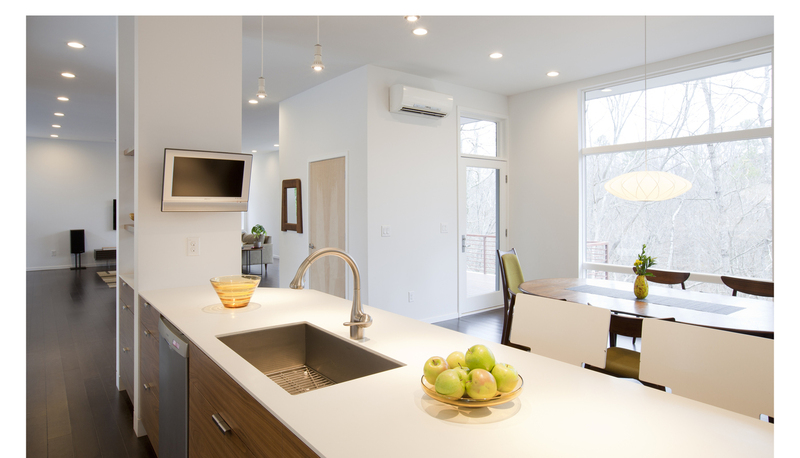 Ductless systems couldn’t be installed using existing central ductwork systems. Many homes in the Seattle area were built with central ductwork systems but were not built with air conditioning in mind. Because heat rises, it is much easier to supply heated air to the upper floors of a home. Air conditioning, on the other hand, is more difficult to push upstairs. It requires more return air to be pulled from the upper floors, which creates lower pressure for the cooler, conditioned air to fill. Builders who designed homes with only heating in mind typically failed to install adequate return air ductwork for air conditioning to work properly. The result is that many home owners, after having central air conditioning installed in their homes, don’t get adequate cooling in the upper floors and are left disappointed. As an air conditioning installer, Evergreen Home Heating and Energy makes sure the home has adequate return air upstairs and, if not, installs additional return air where possible. 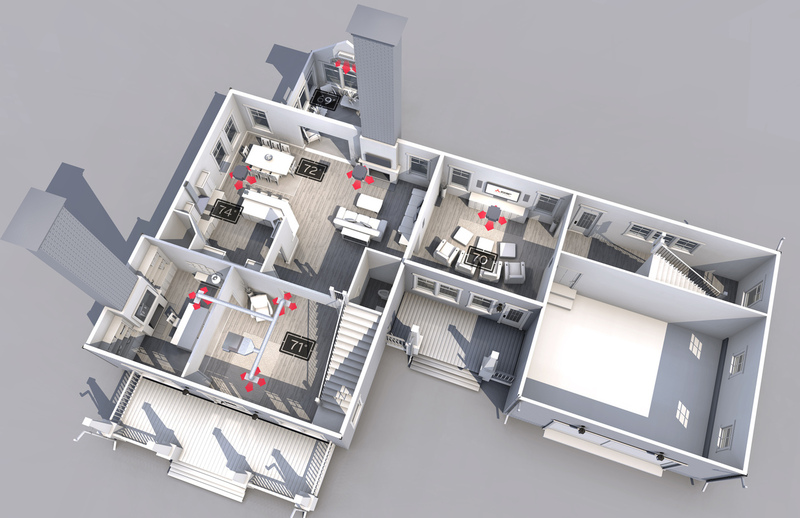 Unfortunately, a home’s design and layout don’t always allow for additional return air. With the limited amount of space for new homes in Seattle, many homes have been built onto or have had living space added that wasn't in the original plan for the home. This includes changes such as garages being converted to living space, basements and attics being finished, or adding an ADU. In many of these cases, the contractor (or homeowner) altered the home with heating and cooling as an afterthought. It is very common for a home with a central ductwork system to have inadequate ductwork in certain parts of the home, or to have an addition that was completely excluded from the ductwork system altogether. Getting heating and cooling into these spaces in a comfortable and efficient way can be highly problematic. Limited yard/property space can be a further issue. Central air conditioning and heat pump units typically have a large footprint, and can also be loud, which limits where they can be installed. 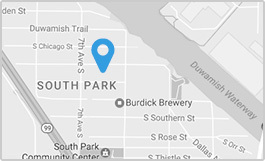 Many properties in Seattle have limited space and are subject to the country’s strictest noise codes, making it difficult to install a central heat pump or air conditioning system. Mitsubishi saw these issues and recognized several holes in the market place. Mitsubishi mini-split heat pumps are now able to be installed with a central air handler, allowing them to work with existing ductwork for the first time. In a nutshell, this means that a Mitsubishi mini split heat pump system is a good fit for almost any home. 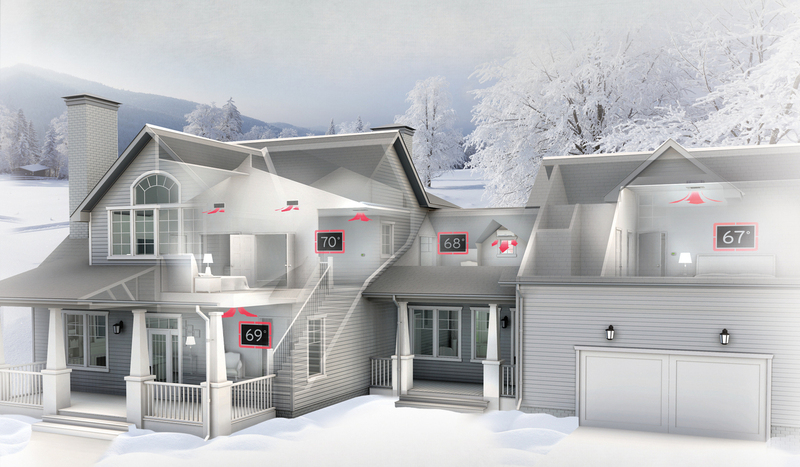 Mitsubishi has created the first truly modern home heating and cooling system. Unlike previous mini-split systems, a single Mitsubishi outdoor heat pump unit can serve multiple ductless and central indoor units at the same time. If your home has central ductwork, we can put in a central air handler that delivers air through the home’s duct system and add additional indoor units in problem areas, such as an upstairs bedroom with no return air. 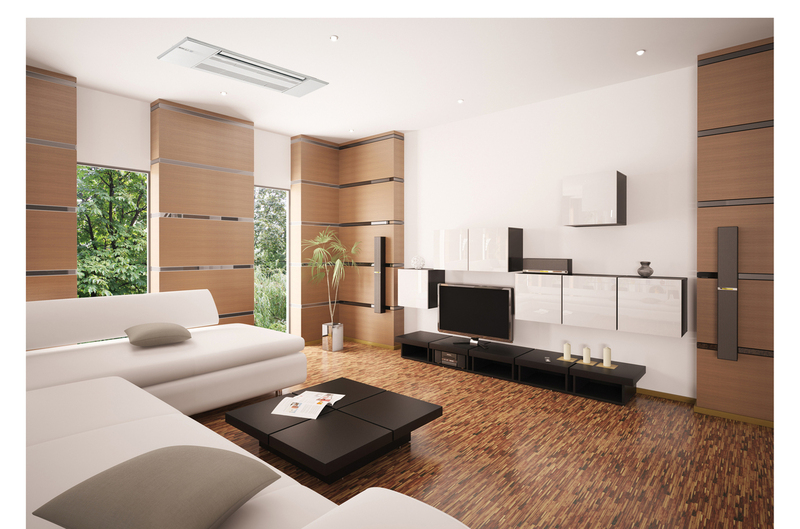 There are a variety of indoor unit options, including flushmount ceiling units, wall-hung units, and floor units. We can do all of this using the same outdoor heat pump, bringing modern comfort and design together with affordability. This new technology allows heating companies to design the perfect system that fits your home and budget at the same time, and solves many problems in an affordable way that just makes sense. Inadequate return air/cooling upstairs, homes with additions, or cold/hot spots: A Mitsubishi mini-split system allows mixing and matching of central and ductless options, allowing the system to utilize your home’s central duct system with optional additional units for trouble spots. Homes with no central ductwork: There are a variety of ductless units, including floor units, wall-hung units, and “mini-ducted” units that can serve several rooms at the same time. In homes with no central ductwork, you can’t beat a mini-split system! Limited yard space: Mini-split outdoor units are designed to fit into tight spaces, and have a much smaller footprint than a larger central air conditioner or heat pump unit. Seattle’s strict noise codes and small lot lines: Not only are mini-split systems designed with a small physical footprint, they are also some of the quietest outdoor units made. This allows them to be installed in many locations we couldn’t install a typical central heat pump or air conditioner. Seattle’s noise codes are the strictest in the country. It takes a very quiet unit to meet Seattle’s codes in most circumstances, and Mitsubishi’s new mini-split systems fit the bill! Budgetary limitations: If you’re looking to upgrade your home’s heating or add air conditioning but are worried about the cost, a mini-split system may be the answer. Mini-split systems are an extremely affordable option, especially when purchased with our available low-interest financing. In many cases, the monthly savings on utility bills will be more than the monthly payment. And the system could pay for itself within a few years. Utilities are also offering sizable rebates for qualifying homes to switch to ductless. Some homeowners are getting up to $2,000 instant rebates! If you’re interested in finding out more about the many heating and air conditioning options available to your home, give us a call and schedule a free quote. We’ll come out to your home, take some measurements, talk with you about any issues you would like to solve with the system, and design the perfect system for your home.